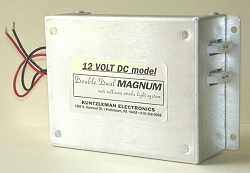 DOUBLE DUAL MAGNUM | Kuntzleman Electronics, Inc. 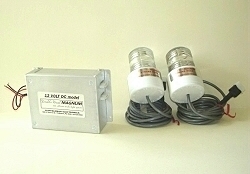 The DOUBLE DUAL MAGNUM STROBE Driver is available in two models, the DDM 12 volt DC model and the SDDM smart model. 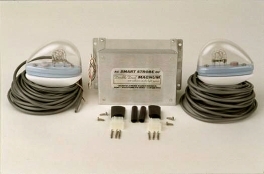 The SMART Model simply means it can be powered by 10 to 80 volts of AC or DC. The 12 volt model is powered by the 12 volt electrical system of your aircraft. The strobe bulb fires a rapid double flash on one head and then the other in an alternating pattern. The first flash catches the eye and the second identifies your position. Total flash rate is 74 per min. Average current draw is less than 2 Amps. The driver measures 4 ½” X 3 ½” X 1 ½” and weighs 10 ounces. Two Round Fresnel Heads, driver, 6’ of 3 conductor wire, plugs, pins, and installation hardware (Tang Mount used on PPC, TRIKES, or where bolting heads to frame is desired). Two Streamline Heads, driver, 50’ of 3 conductor wire, plugs, pins, and installation hardware (includes adaptor plates for curved surface mounting if needed). Our STREAMLINE COMBO head is fitted with LED position lights. RED for left wing, GREEN for right wing, and each have a WHITE in the backside of the head for rear. These heads are machined form solid aluminum and anodize plated. Measuring 3 ¼” X 1″ and weighing 2.8 ounces. They surface mount the same as the Standard Streamline head and here is a great feature, the 12 volt LEDs draw only 1/3 Amp of power per head. The DDM-SLC is our most popular system. Two STREAMLINE COMBO heads, driver, 50’ of 5 conductor shielded wire, plugs, pins, adaptor plates (for curved or flat surface mounting) and installation hardware. Vans RV12, SONEX, & BushCaddy Aircraft adapter plates available at no additional charge when mentioned at time of purchase. Note: The LED section of the Combo heads are 12 VDC powered. Kit #1 is a set of special heads. They are STROBE and RED / GREEN Position light equipped heads WITHOUT the white LEDs, a 2 strobe driver box, that fires both wing strobes in an alternating double wink pattern, a white round LED equipped tail light to be mounted at the rear of the aircraft. Also, included is 50 feet of 5 conductor shielded wire for the wings, plugs, pins and mounting hardware. Total power draw for this system is about 2 ½ Amps at 14 volts. Each system carries a one year warranty and a customer satisfaction guarantee.